Donna Harris has launched several businesses. Donna Harris believes entrepreneurs represent the heart, soul and lifeblood of any economy. Harris, a veteran entrepreneur, co-founded (with Evan Burfield) 1776, a Washington, D.C.-based global incubator and seed fund, which last year opened a campus in Arlington. In late November, she announced that she is stepping down at the end of January as co-CEO of the incubator but will remain an investor and board member. Burfield will become sole CEO. Since its inception in 2013, 1776 has helped support more than 800 startups worldwide, raising more than $330 million in capital and creating more than 2,000 jobs. It is currently working with approximately 600 startups. “1776 has been a vital partner in our business community since its arrival in Crystal City,” says Victor Hoskins, director of Arlington Economic Development. “Some of Arlington’s most innovative technology companies are part of or got their start with 1776.” The companies include Shift, an online car marketplace, and Notarize, an on-demand electronic notary service. In addition to Washington and Arlington, 1776 has sites in San Francisco, New York and — most recently — Dubai. It is the first international technology incubator to have a presence in the Middle East-North Africa region. Harris traces her entrepreneurial career back to the third grade in Lake Orion, Mich. She and a friend collected worms and sold them for use as bait or to improve soil in gardens. Her life has been defined by a series of opportunities. While she was studying finance and accounting at Central Michigan University, she was interviewed for what she thought was a finance job at Electronic Data Systems. Her college counselor, however, put her name on the interview list for systems engineering by mistake. Harris, nonetheless, landed the job. (She later earned an MBA with distinction from the University of Michigan’s Ross School of Business.) “People chuckle when I tell them sometimes life will take you where it’s going to take you. You have a plan, but then something happens in a way you could never have planned for,” she says. She started her first business, CC Corp., in 1998 in Detroit. The company provided consulting and online training on enterprise software such as Oracle. She sold the company after it hit $1 million in revenue in less than a year. Her next venture was Kinderstreet, which sold software for the education, sports and recreation markets. By the time it was acquired by Arc Capital Development in 2005, it was working with more than 900 schools in 41 states. 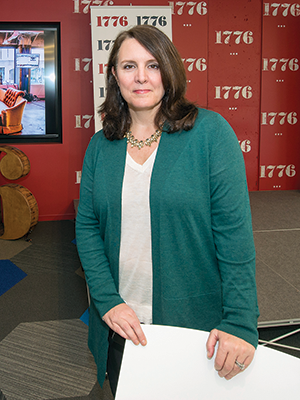 Before the launch of 1776, Harris was managing director of the Startup America Partnership, a White House initiative designed to promote entrepreneurship throughout the nation. “My role was to focus on making it a reality that cities outside of Silicon Valley could become areas where entrepreneurs could thrive,” she says. Each year the incubator hosts a competition, the Challenge Cup, which connects promising new startups with investors and mentors. Next year’s Challenge Cup Global Finals will be held in June in Washington, where entrepreneurs will compete for more than $1 million in prizes. Harris recognizes there are a small percentage of women in her field. “There aren’t that many women … in entrepreneurships and venture capital, but it’s also a challenge across technology … We have to hold ourselves accountable to do better,” she says. Editor's note: This story has been updated to reflect Harris' late November announcement that she will step down as co-CEO at the end of January.